It’s only 47 days until college football kickoff! I mean…not that I’m counting or anything. So in case you can’t tell, I’m excited. I’m a Southern girl all the way, and like all good Southern girls, we know that football comes in just below God and family on life’s priority list. And in case you haven’t read enough of my blog to know, I’m an AUBURN fan to the max. I was born on a Friday in November and the very next day Auburn played Georgia. And since my family doesn’t let anything (including a newborn baby) get in the way of Auburn football, the TV in our hospital room was showing the game and my whole family was there cheering away. My grandfather said, “Well, we’re getting her started off right.” And since watching Auburn beat Georgia when I was only 1 day old, I’ve rarely missed a game. I graduated from Auburn in May of 2010, and I’m so proud to be an alumna of the greatest university in the world! Anyways, I could talk about my love for Auburn all day long. So let’s talk about what you can eat while you’re watching your favorite team! 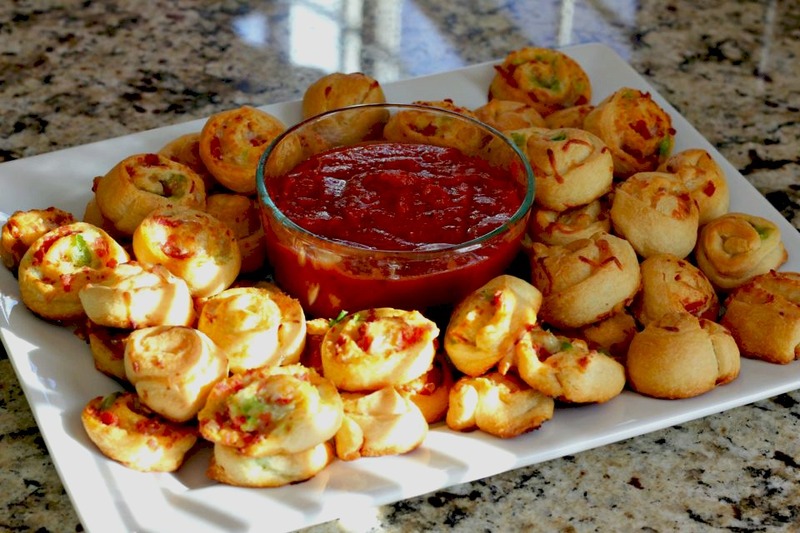 These pizza pinwheels make a great tailgate food. So whether you love college football, NFL, or some other sport that’s not nearly as awesome as football, you should definitely serve these up to your fellow fans. In fact, these just make a great appetizer for any get-together. I served them at my brother-in-law’s birthday party, and they were a big hit. It’s one of those appetizers that just acts like a magnet that draws people in. Everyone was gathered around the platter dipping and eating this delicious finger food. You can of course modify this recipe to put in whichever pizza toppings you like. Preheat oven to 350°F. Spray cookie sheet with cooking spray. Unroll crescent dough; separate dough into 4 rectangles. Firmly press perforations to seal. These look so good! Perfect for a crowd. Thanks for sharing! Those sound a lot like my pizza rolls but on a smaller scale (which next time I’m gonna be doing smaller). Those are gonna make great appetizers for football season. Speaking of football, will you do this Texas friend a favor? Kick the crap outta A&M? haha we will certainly do our best! I think A&M is in for a rough season now that they’re in the SEC.